The first downspout was installed in the thirteenth century to resolve the same problem gutters still solve today. It protected the freshly painted walls of the Tower of London. Modern gutter and downspout combinations are inseparable. Depending on the style, the shape can be rectangular or round. Downspouts are the vertical portion of the gutter system. They run along and are connected to the outside of the home. A downspout is positioned to spread water evenly, avoiding erosion and impact which causes irregularities in the lawn. They also move water away from the foundation to help stop foundation movement. To avoid pooling, rainwater is directed evenly over the turf. Alternatively, a downspout can drain into the ground, through a garden, or into a water collection system such as a rain barrel. Gutter Tex uses rivets to attach downspouts to ensure the most secure connection and prevent damage to your home. Elbows and offsets may be used to compensate for overhangs and uneven or irregular walls. Connections must be sized correctly to prevent water from collecting and overrunning the gutter. Improperly sized, incorrectly attached, or missing downspouts cause leakage that will damage paint, siding, and overall home structure and can harm soil integrity and foliage. Through lack of maintenance, wear-and-tear, improper installation, or damage from objects and weather, your downspout may need repair. Fastenings may pull free or it may develop leaks, tears, or pull loose from the gutter. Methods and cost to repair will depend on the material you chose for your gutter system. Gutter Tex employs experts in sealing and repair, no matter which metal yours is made of. We can reseat and reseal a downspout that has come loose if the gutter is still viable. Fastenings likely need to be repositioned, and the siding repaired, for optimum placement. Holes in the material can require the downspout to be removed and rehung. The downspout can be one of the biggest problem areas for clogs. Gutter Tex recommends regular gutter cleaning to prevent this. Check out our Gutter guards to help extend times between cleanings too. Most blocks occur when leaves or debris gather at the mouth and restrict or stop water flow. Even with gutter guards in place, scheduled cleaning must be observed. Grit, dirt, pollen, sap, and small debris may otherwise find their way into the downspout. Over time they will gather below the junction and cause a clog. 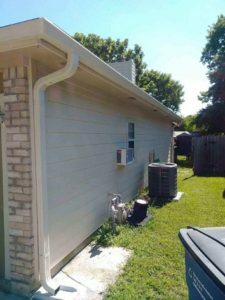 When this occurs, the downspout must be removed, cleaned, and reattached. We can install and properly position rain barrels at the end of each downspout for rainwater collection. If you want a decorative touch, rain chains may be an alternative option. We will assess how well rain chains will work on your home if requested.